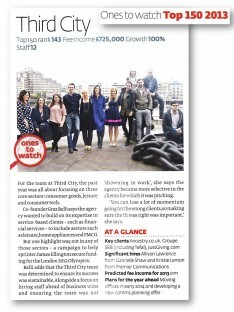 Hot off the wire: We made it into today’s PR Week’s Top 150 Consultancies -straight in at 143! The report, which ranks agencies by annual fee income, provides an annual snapshot of the UK PR and comms industry. The listings cite Third City as one of just four companies destined for success in 2013. As PR Week commentates, the table makes good reading for the industry, which has clearly perked up in the last 12 months and as Lord Bell says, is having more influence over events than ever.